Today we were welcomed by many generous people into their places of worship. 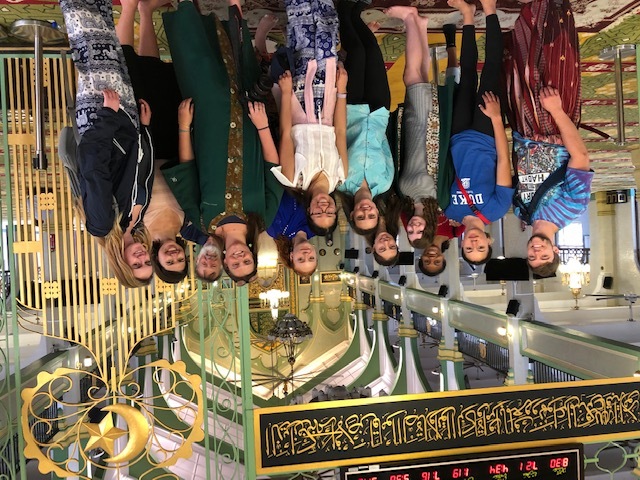 We learned about Judaism, Islam, and Sikhism through the eyes of Singaporeans. These kind people took time out of their day to teach us about their religion and, more specifically, their religion in the context of Singapore and the environment. 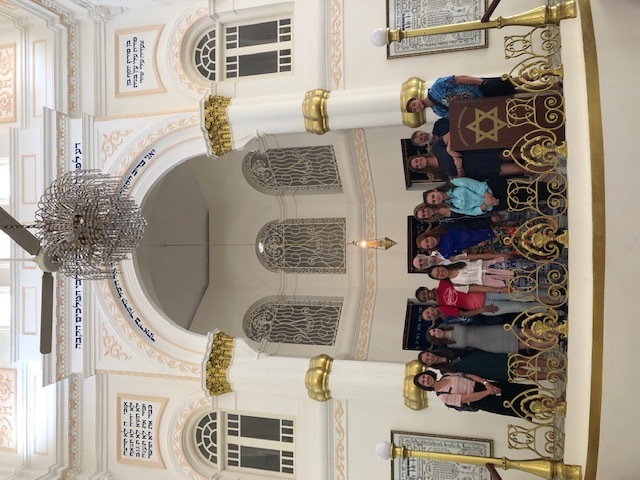 Our first stop of the day was the Chesed-El Synagogue, which was opened in 1905 by Sir Manasseh, and is one of two synagogues in Singapore. We were welcomed by Rabbi Fettmann, who taught our class about Judaism and showed us around the Synagogue. We were awed by the beautiful architecture and gold and white details in the Synagogue. Rabbi Fettman kindly showed us the Torahs kept in intricate wooden cases and explained that families donate them in memory of loved ones. Our second stop of the day was the Sultan Mosque. The Sultan Mosque was originally built in 1826 and was rebuilt in the 1920s. It has been renovated and refurbished multiple times since then and is known for its stunning architecture and beauty. We walked around the inside and had the opportunity to talk to two women who attend the Mosque and volunteer to answer visitor’s questions. The Sultan Mosque is Sunni, which is the main branch of Islam in Singapore. There were educational signs throughout the Mosque explaining the basic teachings of Islam. We had a brief stop at a Buddhist Monastery between temples. While we did not have much time to explore, it was very beautiful and interesting to see. Everyone left with the desire to return. 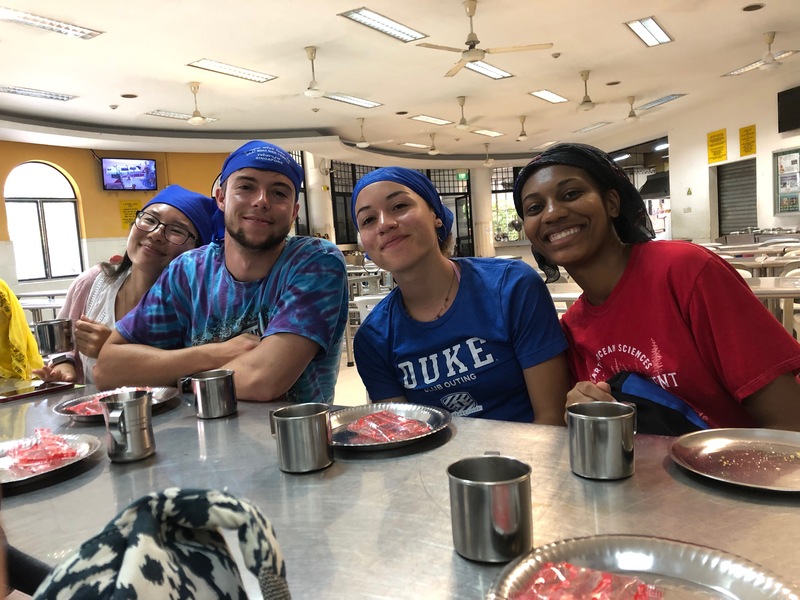 Our last stop of the day was a Sikh place of worship, called a Gurdwara where our guide Hardip gave us a presentation on the Sikh religion, showed us around the temple, and sang a hymn for us. Hardip taught us that there were ten Gurus, and their teachings are in the Sikh Scripture, the Guru Granth Sahib. There are five Ks of Sikhs follow and carry with them. The first K is Kesh, which means that hair is to be uncut and covered with a turban or a scarf. The next K is Kanga, a wooden comb, which symbolize cleanliness. A Kara is a steel bracelet worn to symbolize that God has no beginning and no end. Kachera are similar to boxer shorts and often worn as undergarments. The final K stands for Kirpan, which is a small sword carried to symbolize protection of yourself and those that cannot protect themselves. Hardip stressed the importance of inclusivity and equality in the Sikh religion as well as the importance of focusing on the present moment. Before entering the Gurdwara, we took off our shoes and covered our heads. Another rule for Gurdwaras is that meat is not allowed. Every Sikh Gurdwara has a kitchen where everyone is welcome for a meal regardless of religion. Our class was there in the afternoon during teatime and we were given Masala tea and crackers. Throughout all of the places that we visited, there were some common themes. The first is the role of religion in caring for the environment. At the Synagogue, the Rabbi spoke about Tu B’Shvat, a Jewish holiday that is celebrated by planting trees. He also spoke about the importance of protecting the Earth for future generations, which is taught through the Jewish concept “Tikkun Olam” (the importance of caring for the world we live in). At the Mosque, the Quran was quoted to emphasize the connection between Islam and the environment. The importance of avoiding excessive waste was emphasized by teaching that water should not be wasted, even when used for religious purposes. There were also teachings about the importance of planting trees, both because of what humans can gain from them, and because it is the right thing to do. At the Sikh Temple, Hardip explained that protecting the environment is part of the Sikh teachings and that the sixth Guru especially emphasized the importance of the environment. 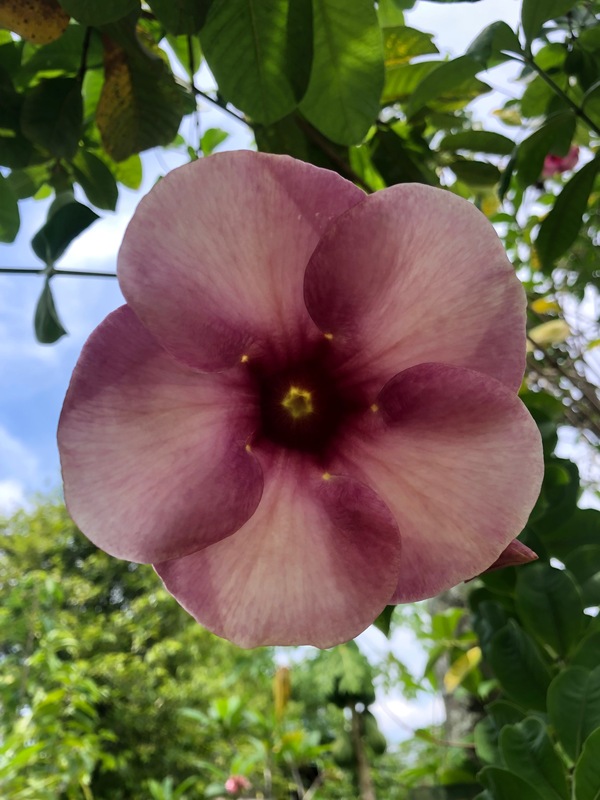 The sixth Guru taught that one should not do so much as pick a flower. Another common theme across the religions in Singapore was the acceptance and welcoming of other religions. At each place we asked what the relationship was between the many religions and cultures in Singapore. At each site we were given a similar answer: everyone is respectful of other religions and gets along. Multiple people that we spoke to mentioned the importance of education in religious harmony because children are taught about other religions from a young age. This increases their awareness and acceptance of others and encourages cultural understanding and mixing. A woman at the mosque told us that there is a conference held each year for people from different religions to come together, and each year a different religious leader is chosen to give a speech. Everyone seems to get along both within and across religions. While I learned a lot about different religions today, there is still much to learn both about the religions we saw and the other religions present in Singapore. 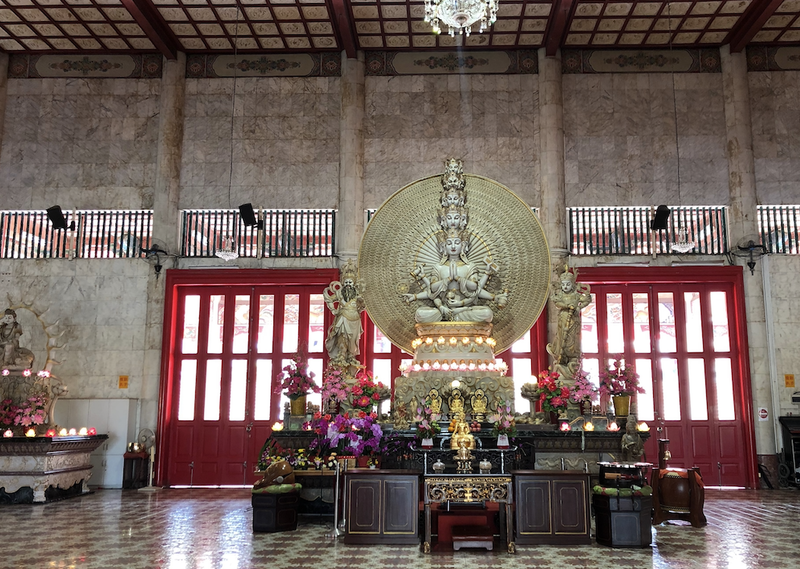 As one woman in the Gurdwara pointed out, it is impossible to learn about and visit all of Singapore’s religions in one day. And while we may have just scratched the surface, we ended the day with a better understanding of culture and religious life in Singapore.